Place the pork chops between two sheets of plastic wrap and pound them with the flat side of a meat tenderizer until they're 1/4 inch thick. Sprinkle lightly with salt and freshly ground black pepper. Set aside. 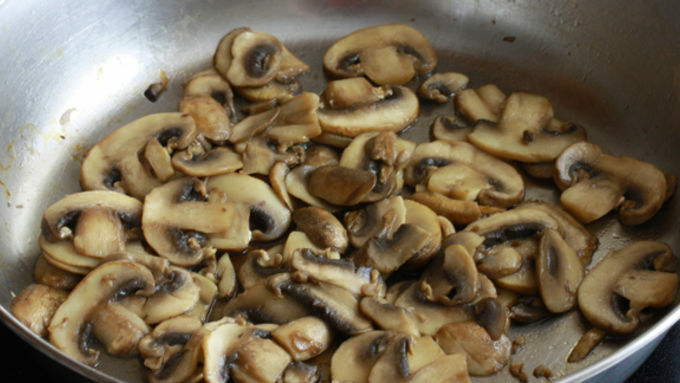 If using fresh mushrooms, heat a teaspoon or so of olive oil in a small skillet over medium-high heat and add the mushrooms. Cook until the mushrooms have released their juices and the liquid is mostly evaporated. Transfer the mushrooms to a plate and set aside. 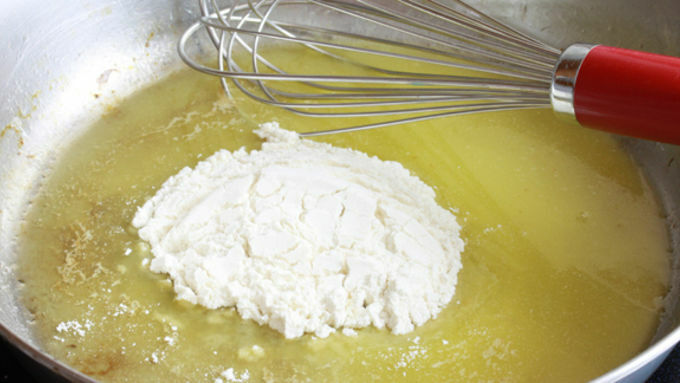 In the same skillet, melt the butter, add the flour, and whisk until the flour is dissolved. Continue to whisk constantly until the mixture is a rich, deep golden brown, about 3-4 minutes. Slowly add the beef broth, whisking constantly, until combined. Return the mushrooms to the skillet. If using canned mushrooms, you'll add them at this point. Bring the gravy to a simmer, reduce to low, and simmer uncovered for about 15 minutes or until the gravy is thickened. Season with salt and pepper. While the gravy is simmering let's get back to the Schnitzel. Working quickly, dip the chops in the flour, the egg, and the breadcrumbs. Don't press the breadcrumbs into the meat. Coat gently but thoroughly, and gently shake off the excess crumbs. Make sure the cooking oil is hot enough at this point (about 280°F) as you don't want the Schnitzel to sit around in the coating for long before frying. 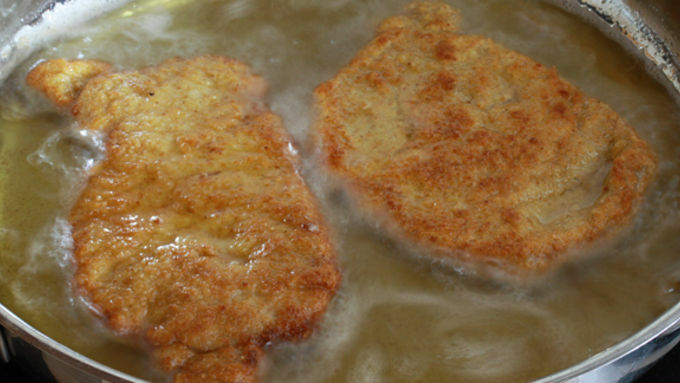 Fry the Schnitzel for about 2-3 minutes on both sides. When they're a deep golden brown, transfer them to a plate that's lined with paper towels. Serve immediately with the mushroom gravy and your choice of sides. Schnitzel. Tender and juicy inside and fried to crispy golden perfection. That glorious dish that tourists to Germany return home raving about. Now you can make it at home! I grew up in Stuttgart in Southern Germany. Stuttgart is the proud home of Mercedes-Benz, Porsche, Bosch, and the first VW Beetle prototype, just to name a few things. Stuttgart is also the capital of Baden-Wurrtembert, the Swabia region of Germany, which boasts the best food in the country. 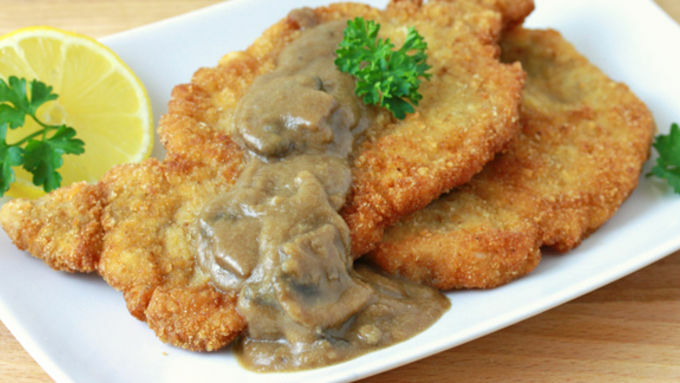 Schnitzel is a dish I grew up loving, and I'd often order it when we went out to eat. Of course it had to be served with Spaetzle, the famous Swabian noodles. 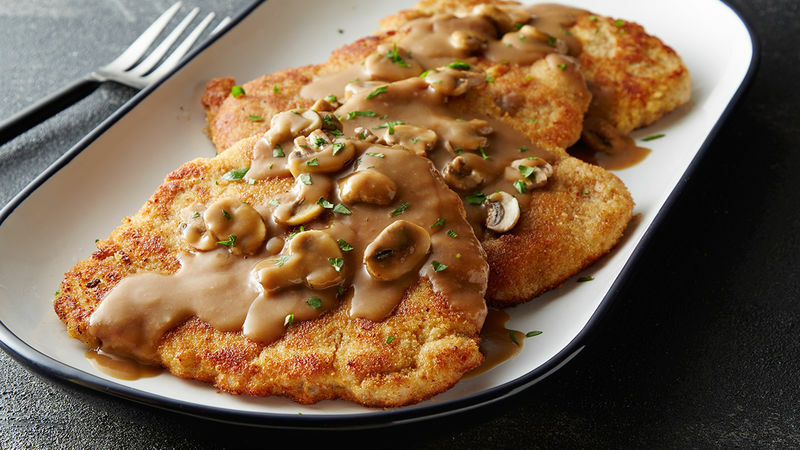 Today we're going to make Jaeger Schnitzel, a very popular version of Schnitzel that features a delicious mushroom gravy. There are a few tips and tricks to achieving the perfect Schnitzel, and I'm going to share those with you. I'm hungry, how about you? Let's get to those Schnitzels! The first key to achieving the perfect Schnitzel is to pound it very thin. That way you can fry it quickly at high heat to get the perfect crust without leaving it raw in the middle. You want to pound it to 1/4-inch thick. 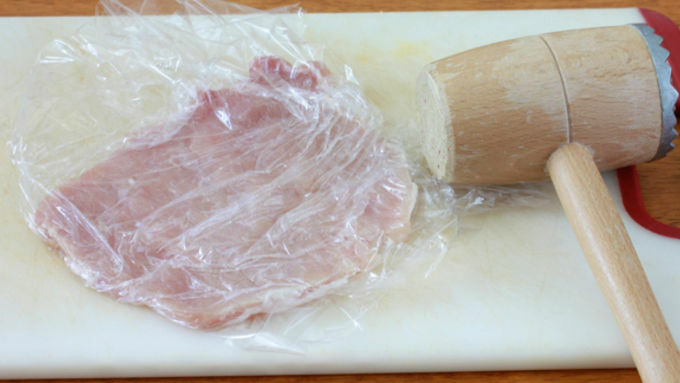 Place the pork chop in between two sheets of plastic wrap and pound it with the flat side of a meat tenderizer (not the side with the points). 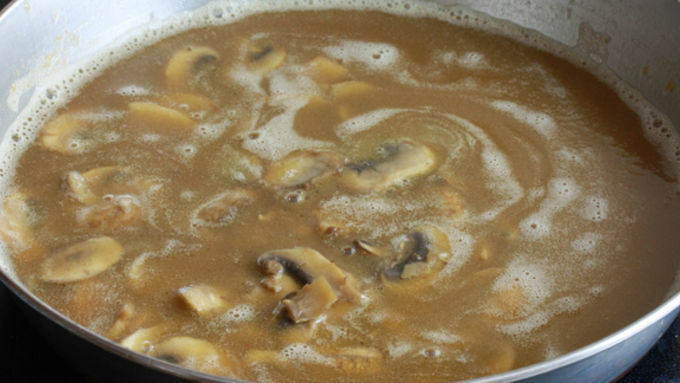 When making the gravy you can use either fresh or canned mushrooms – whatever works best for you. If using canned, you'll just need to add the mushrooms at a different stage of the gravy. The next key to the perfect schnitzel is to work quickly with the breading. Line up three shallow dishes, one with flour (with a little salt mixed in), one with beaten egg, and one with the breadcrumbs so you'll be able to dip the chops from one to the other quickly and toss 'em in the frying pan! Avoid pressing the breadcrumbs into the meat. Just softly coat the chop on both sides and all edges, and gently shake off any excess. Another key is to immediately fry the Schnitzel. Don't let them sit around in the coating! The final important key is to make sure the oil is hot enough, but not too hot. It should be around 330ºF – test it with a candy thermometer. If it's too hot, the crust will burn. If it isn't hot enough, you'll end up with a soggy coating. When the oil is good and hot it actually penetrates the coating less, so you get less oil in it. The result will be a beautifully crispy coating with a tender and juicy interior, and that's exactly what we want. Serve immediately with the mushroom gravy and choice of sides. Guten Appetit!